Bombing suspect’s van...US Soccer Sticker? Discussion in 'SoCalScene' started by younothat, Oct 26, 2018. "Law enforcement officials arrested a man in Florida, identified as Cesar Sayoc, in connection to the 12 mail bombs sent to lawmakers and public officials Friday. For a brief moment, cable news broadcast a blurry image of a white van thought to belong to the suspect, before law enforcement covered it with a tarp. 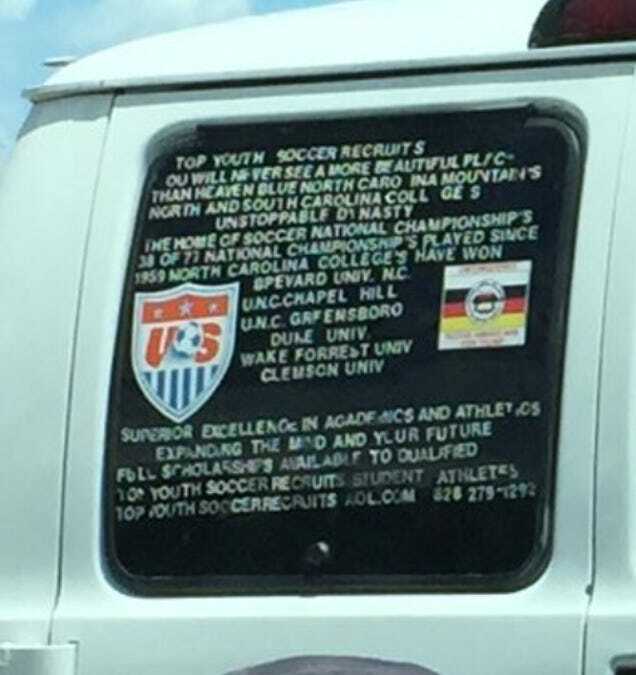 A resident of Florida later sent an image of the van to CBS Miami, which clearly showed the vehicle was covered in pro-Trump stickers"
Not sure what all the stickers are about but looks like there into US soccer also among other things? why? Maybe Hope Solo stole it for a ride to the bar? Ah "A man named Cesar Sayoc appears to have played 11 games for the UNC-Charlotte men’s soccer team in 1983"
Nah.. I think he didn't get enough orange slices at U9. And then his mommy yelled at the coach for playing her superstar son on the backline. Then he once got an undeserved yellow card from a ref that was out to get his team. And one day he missed training to go to prom, so his coach benched him for the 1st half. All of that stuff can really wear on a kid. And then one day they snap and start sending mail bombs to Republicans. Was he a Right winger? Sterotypes & jokes aside this guy obviously wanted to express his opinions & did so very loudly with the stuff on his van. Civil political debates , dicussions conversations, rallies have been somewhat overtaking with these partisan sometime crazy events and senseless acts of violence. Forget party lines or what political ideology you may subscribe to, respecting others peacefully, voting your conscious is what we should striving for. Dang when I saw this "Top Youth Soccer Recruits for .... "
Actually were sent to anti-Trump folks, not Republicans. Shows you how much I pay attention to politics.